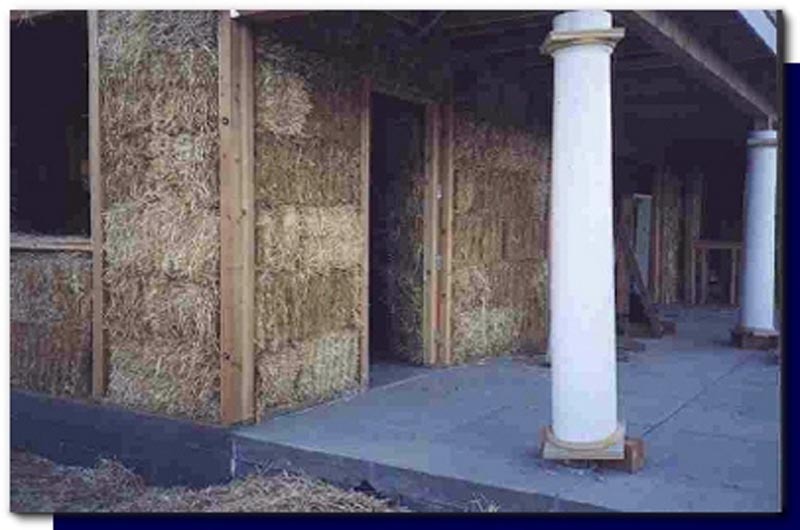 – Building a home using straw bales basically, from the collection of waste from wheat crops in the environment. 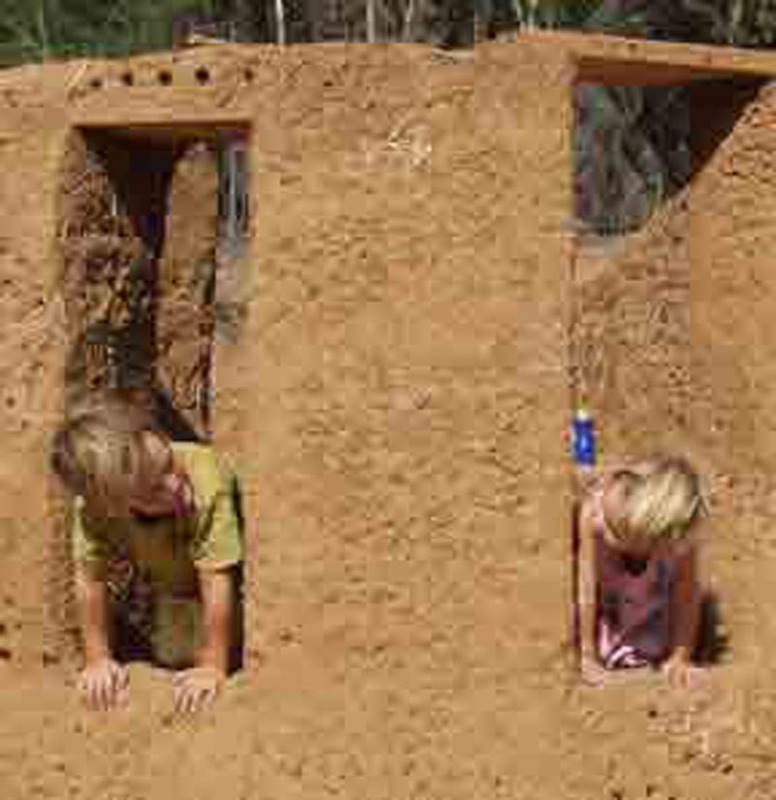 We also want to use adobe bricks using clay from the place, and mulches. necessary for its occupants: Fruits, grains, tubers. Because housing is located in a hostile environment (Nijar, Almería) the architectural structure of the house is closed, and is “dumped” the inner courtyard. The house only has windows on the perimeter walls to protect themselves from the hot, sandy winds in the area. 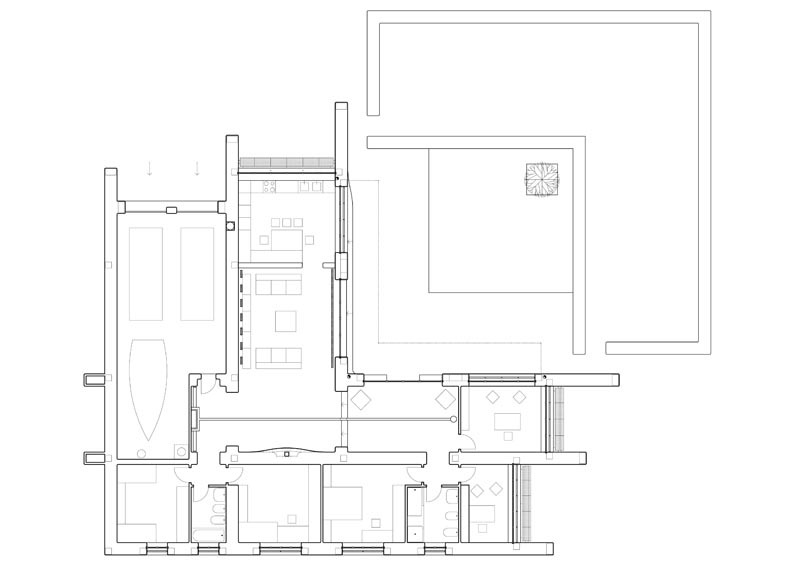 Instead, the house opens to patio with large windows to the south and east, in order to maximize natural lighting. Around the courtyard stands a biological garden, fed by greywater housing, and the compost from organic waste it. The architectural structure of the house is a reinterpretation of agricultural ranch in southeastern Spain. For this reason we have used the Arabic tiles on the roof (even on a solid structure with Arlita lightweight concrete on beams structure), and load-bearing walls of extreme width. 1.1. Natural Resources. Are maximized resources such as sunlight (for home heating), the breeze and land (to cool the housing), straw, mud, dirt, stones in the environment (to build the house), water rain (for watering the garden and the toilet tank), … ..
1.2. Manufactured resources. The materials used are maximized, thus avoiding the maximum possible waste through proper project and effective management. On the other hand, proper housing design allows to be built with little supporting resources. In fact, the users can build more than half of the house. In the construction of housing have been used waste (waste recovered, and even waste generated in the construction of the house itself), such as packing tape, scraps of metal, … have been used as filler in lightweight concrete roof with Arlita . Others such as bags, packaging, etc … are used as waterproofing. Other wastes such as wire mesh, scrap metal, bars, etc … were used as reinforcement of the foundation. On the other hand, recovered materials have been used, in perfect condition, but with a prior use (wood beams, tile, frame, straw bale, tiles, …). 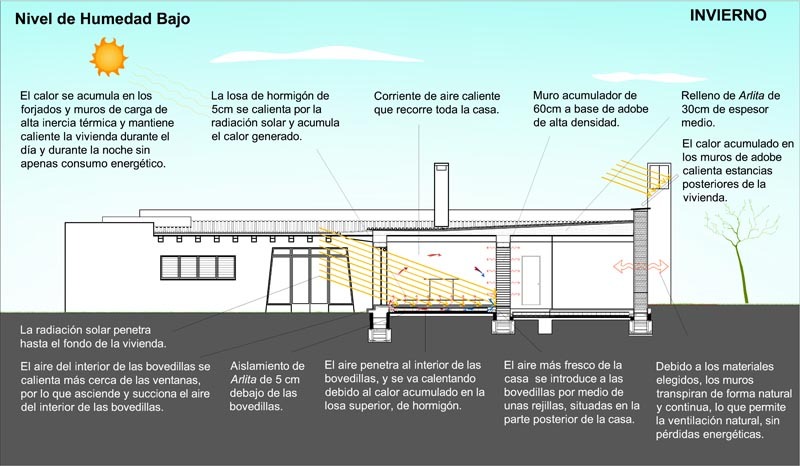 Due to its characteristics bioclimatic housing has no conventional energy, not renewable. The house is heated greenhouse, and a stack of biomass (waste on the environment). 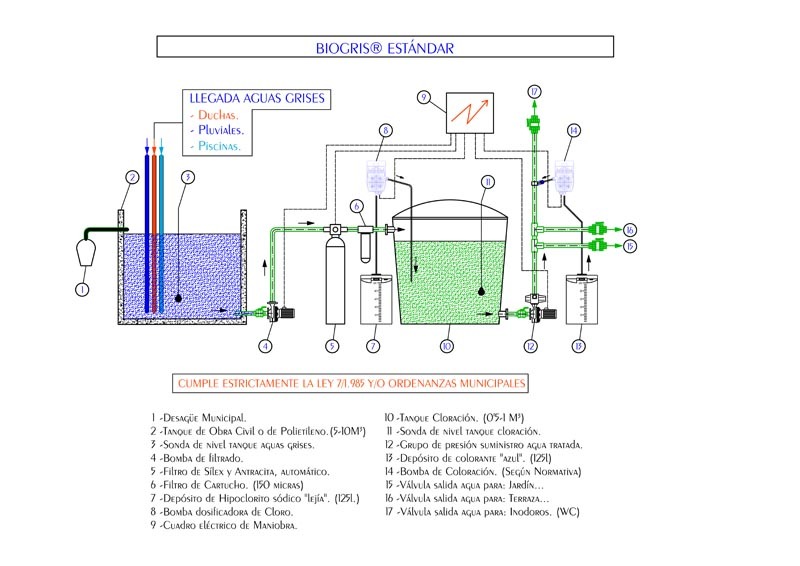 The hot water is generated by three solar thermal sensors. The electricity needed for appliances is generated by a set of photovoltaic sensors (3 kw / peak). Only gas bottles are needed for the kitchen and refrigerator. Thus, the energy cost (and thus economic) is negligible. The vast majority of the materials used are biodegradable. And the rest can be recovered easily (once the life of the building) to be reused in the construction of another building (wooden beams, tiles, ceramic tiles, windows, shutters, railings, doors ..). Therefore not generate any type of waste in the disassembly of the housing (the definition of demolition has no place in a truly sustainable architecture). 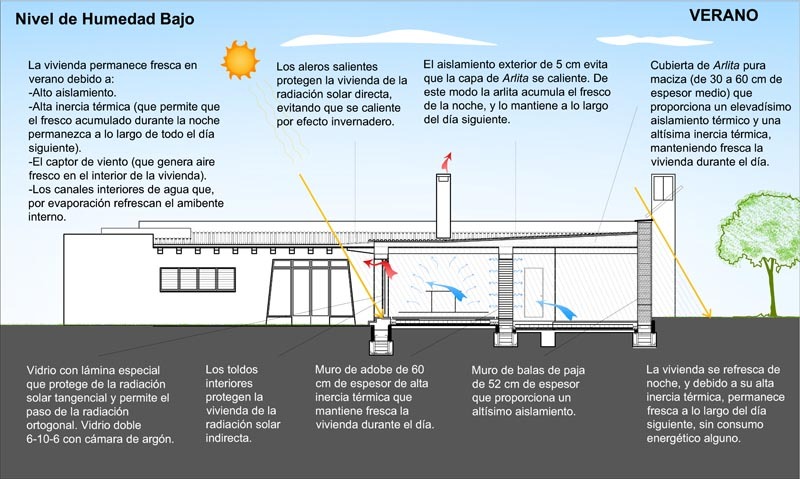 The energy used is of four types: wind (domestic wind generator 1 kw), solar thermal (three solar collectors for DHW), solar PV (photovoltaic solar collectors to generate 3 kW / peak), and geothermal (system refresh taking advantage of low air temperature at 2 meters underground in the galleries below the suspended floor of the house). The only emissions from housing are generated by the fireplace of biomass, on the few occasions it is necessary to use. There are no other emissions. Nor is there any type of waste. Not generated residue in housing construction (indeed, have been used in its construction waste). Household waste generated is used to treat them properly again (gray water for garden irrigation, sewage and household waste to compost the organic garden.) The packaging of food and household products are accumulated in containers, s to be treated later. The house is designed in a rational manner, eliminating redundant items, unnecessary, or free, allowing construction to a greatly reduced price, despite the ecological equipment incorporated. Similarly, housing is very easy to maintain, routine cleaning, and processing wood biennial vegetable oils. The house is heated by itself, in two ways: 1. Avoiding cool: Due to its high thermal insulation (straw bale walls of 60 cm. Thick, and insulated suspended floor on the underside), and having the glass surfaces just south and east, and none to the north. 2. due to its careful and special bioclimatic design. Greenhouse is heated, direct sunlight, very high isolation and a stack of integrated biomass in the central wall of adobe. Housing cools itself in three ways: 1. Avoiding hot, glazed surfaces having only south and east, just west; disposing of sunscreens for the direct and indirect solar radiation, and providing adequate insulation. 2. Cooling by air cooling system using two wind sensors, and a series of underground galleries. On the other hand, due to high thermal inertia of the housing, the accumulated fresh overnight stays for nearly all the next day. 3. Evacuating the hot air outside the house, through a solar chimney and natural convection. 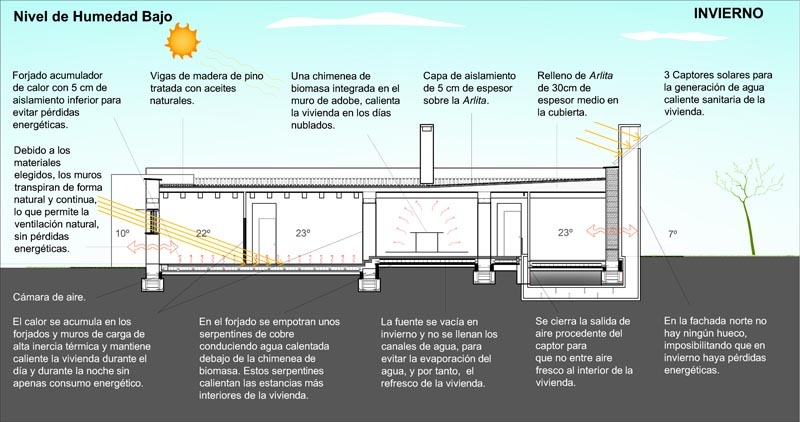 The heat generated during the day in winter (greenhouse effect, direct solar radiation through the chimney of biomass) accumulates on the floors, adobe walls load of 55 cm. thick and solid cover of lightweight concrete. Thus the house stays warm all night, with little energy. Generated during the cool summer night (for natural ventilation due to lower temperatures outside) accumulates on the floors, adobe walls load of 55 cm. thick and solid cover of lightweight concrete. Thus the housing remains fresh throughout the day without any energy consumption. 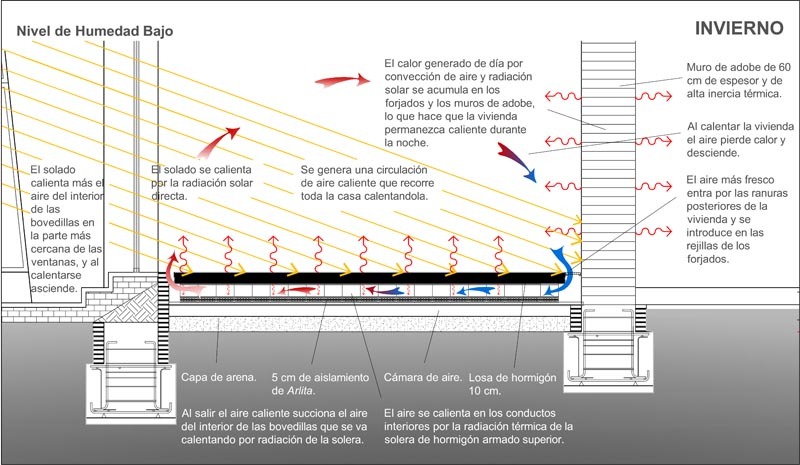 The heat generated by the greenhouse effect and natural radiation is transmitted to the rear of the housing through air currents inside the suspended floor. The heat from the chimney of biomass is transmitted through the adobe wall and a set of copper pipes under the flooring tiles of clay, spread across the central part of the house. 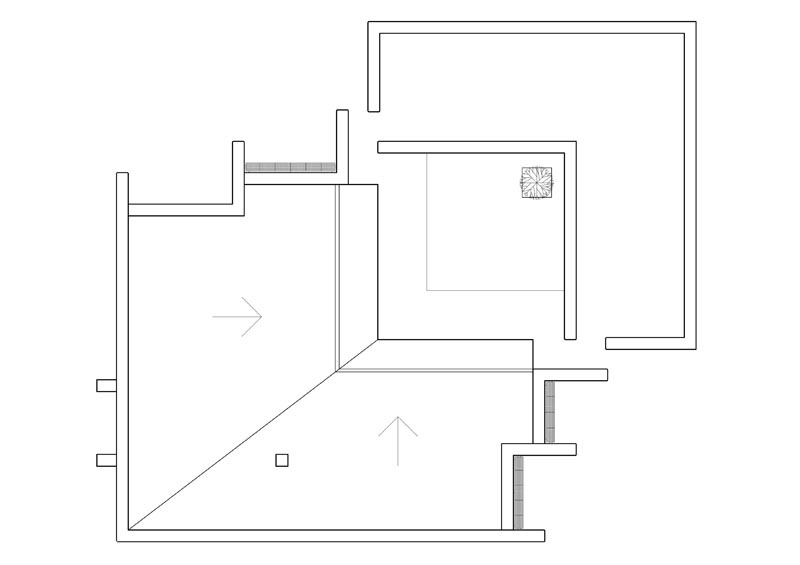 The cool air generated in the underground galleries for the housing is divided by a set of grids spread over the floor of the house. Also generated by the evaporation of fresh water flowing through a set of water pipes located throughout the interior of the house. 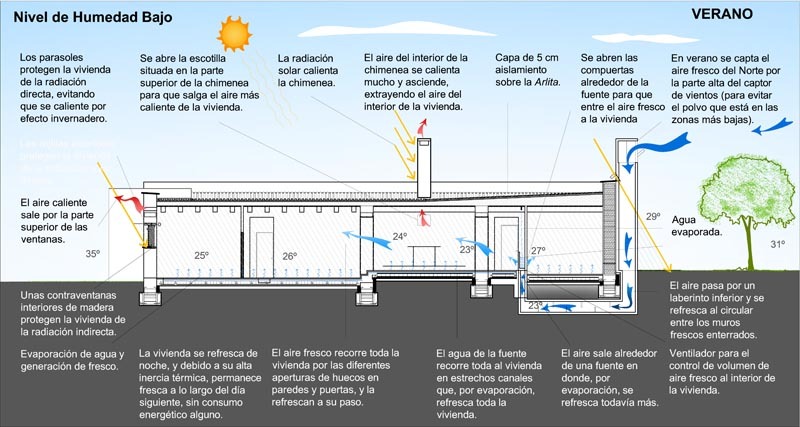 The ventilation of the building is continuously and naturally through the very walls surround, allowing adequate ventilation without energy loss. This type of ventilation is possible as all materials are breathable (straw, lime-cement mortar, lime paint), but the whole performance has a completely waterproof. Structure of bearing walls of straw bales (walls 60 cm. thick, made of straw bales 52 cm. thick), and bearing walls of adobe bricks (60 cm walls.’s thickness, adobe base of 55 cm. thick). The walls based on straw bales are covered with a cloth chicken coop, 4 cm. lime mortar and lime paint. The adobe block walls have been coated with a layer of lime mortar. Lime paint. Tile Flooring clay to 700 degrees. Double doors plywood board OSB, treated with vegetable oils. Pine beams, which holds a layer of lightweight concrete with Arlita, rubber waterproofing material and Arabic tiles. – heat transfer system by the suspended floor slabs (cut off by the bottom Arlita slabs of 5 cm.). 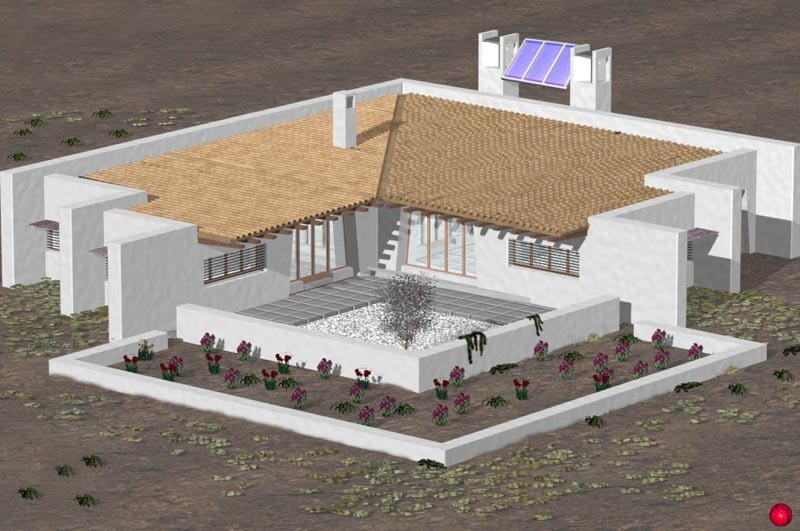 – Exterior walls based on straw bales. The system used allows the overall breathability and protects the straw from insects and rot. – Make a house practically biodegradable. The biodegradation process begins when the maintenance process ends. – Conduct a home with a high level of self. The homeowners wanted to make “at least” 60% of the necessary work.